dog lollipops. Photo courtesy Elegant Affairs Caterers. Today is National Lollipop Day. But lollipops are more than sugar-on-a-stick. 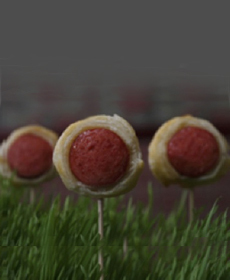 There are also savory lollipops, popular as hors d’oeuvres at cocktail parties and snacks at kids’ parties. The difference between savory lollipops and other food-on-a-stick—such as corn dogs and kebabs—is the size: single bites, in the case of lollipops. Lollipops add a touch of whimsy, a new way to present the classics. Just in time for weekend fun, here are two recipes from Andrea Correale, owner and founder of Elegant Affairs Caterers, a company in metropolitan New York that is one of the leading Hamptons caterers and event planners (she has catered events for L.A. Reid, Mariah Carey, Russell Simmons and P. Diddy, among others). While the two recipes below require preparation, you can make simple variations without planning ahead. Just keep a package of six-inch bamboo skewers on hand. Then, if you need an hors d’oeuvre or kid treats in a hurry, you can look in the fridge and freezer and make lollipops from whatever you have: meatballs, chicken nuggets, hot dog and sausage chunks and cubes of cheese, with a dipping sauce. If you don’t have wheatgrass or other food to anchor the sticks, put them in a short jar, or lay them on a tray. 1. Preheat oven to 400°F. Flour the puff pastry sheet and add Cheddar to one side of the sheet. Evenly distribute and flatten with your hands. 2. Place one end of the pastry dough over cheese end and fold over. Using a floured rolling pin, roll out the dough. 3. Mix mustard and eggs and brush Dijon egg wash all over dough. 3. Take hot dog, place at edge of dough. Take puff pastry and roll around hot dog. Use egg wash to adhere. 4. Cut away the excess dough and pinch the ends together. Repeat with each hot dog. 5. Place on a carving board and cut the ends off. Slice into 3/4″ thick pieces. 6. Place on a parchment-covered baking sheet and bake for 8-12 minutes or until golden brown. 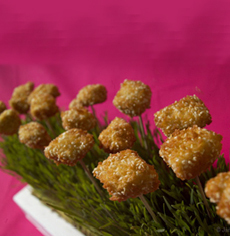 Insert a skewer into each piece and place in a wheatgrass-filled tray. You can also make these with tofu for vegetarian guests. Sesame Chicken Lollipops. You can substitute tofu. Photo courtesy Elegant Affairs. 1. Sift flour with 2 tablespoons of cornstarch, baking soda and baking powder. Mix together soy sauce, water, vegetable oil and a pinch of sesame oil; stir into flour mixture until smooth. Fold in chicken pieces until coated with the batter, then cover and refrigerate for 20 minutes. 2. Heat oil in a deep fryer or large saucepan to a temperature of 375°F. Drop in the battered chicken pieces and fry until they turn golden brown and float to the top of the oil, 3 to 4 minutes. Drain on a paper towel-lined plate. 3. Sprinkle with toasted sesame seeds to garnish. To serve, skewer chicken pieces using long wooden skewers. Lie on a platter with the dipping sauce, or stick into a 2-day-old loaf of round bread. 1. In a small bowl, whisk together miso, water, sugar, vinegar, soy sauce and salt. 2. While whisking, gradually add peanut and sesame oil until you have a creamy dressing. 3. Serve with White Sesame Chicken Lollipops. See the Elegant Affairs website for more delicious party ideas.